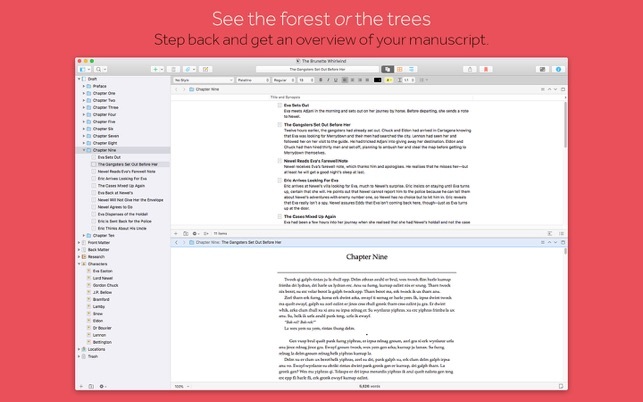 Tailor-made for creating long manuscripts, Scrivener lets you break up your writing into sections as small or large as you like. At its heart is a simple ring-binder metaphor—gather material and switch between writing, notes and research with ease. Got a great idea but don’t know where it fits? Compose your text in any order you want—write when inspiration strikes and find its place later. 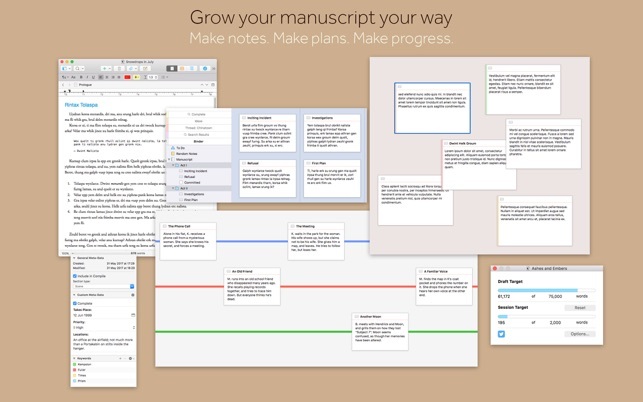 Whether you plan or plunge, Scrivener works your way: hammer out every last detail before typing a word, or carve out a draft and restructure later. Or do a bit of both. 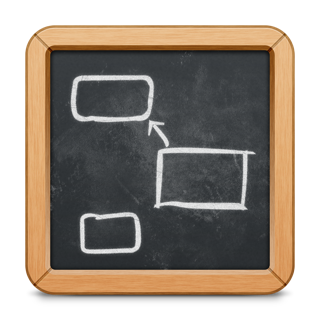 All text sections in Scrivener are integrated with an easy-to-use project outline, so working with an overview of your manuscript is only ever a click away, and turning Chapter Four into Chapter One is as simple as drag and drop. Need to refer to research? 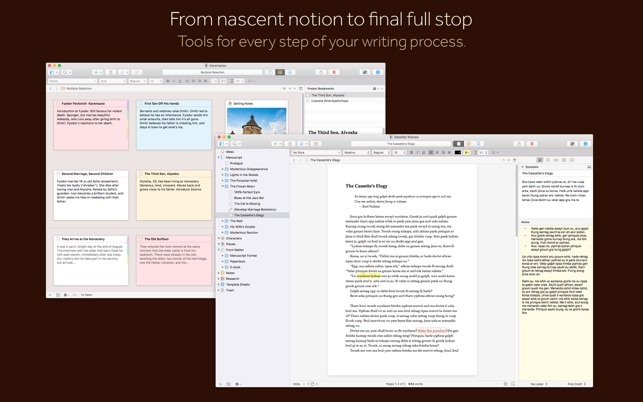 In Scrivener, your background material is always at hand, and you can open it right alongside what you’re working on. Write a description based on a photograph. Transcribe an interview. Or check for consistency against an earlier chapter. Once you’re ready to share your work with the world, turn your manuscript into a beautiful ebook or PDF, export to Word, or simply print it out. You can even share using different formatting, so that you can write in your favorite font and still keep your editor happy. 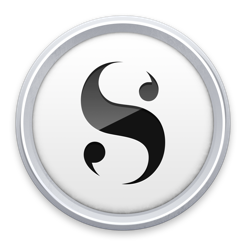 Scrivener’s users include best-selling novelists, screenwriters, students, academics, lawyers, journalists and translators. It won’t tell you how to write—it just provides everything you need to start writing and keep writing. We have a whole heap of testimonials from published authors—see our testimonials page at http://www.literatureandlatte.com/scrivener/testimonials to read what they have to say. • Added options to reduce exported file sizes by resampling and resizing images. • A new “Add printer marks” option for PDF causes trim marks to be drawn. Bleed settings are now available for the cover image. • Ebook tables are now more flexible. • You can now assign Keep with Next to Section Layout prefixes and suffixes. • Added “Copy to Project” to the “Documents” menu as well as to the binder, corkboard and outliner contextual menus. 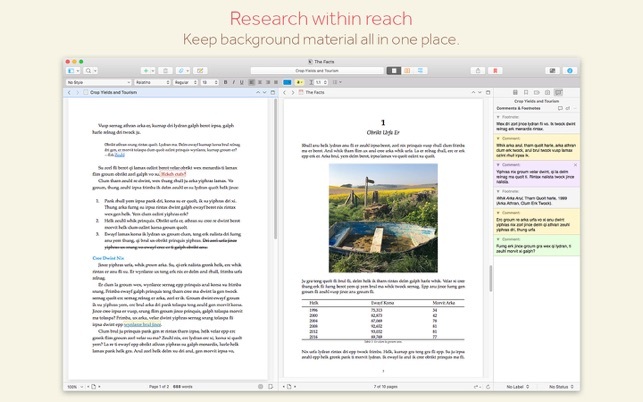 This makes it easier to copy documents to another project without having to drag and drop. • A new “Find Duplicates” option has been added to Project Search. When ticked, the search results show only documents whose text (or whichever part of the content is marked for search) appears more than once in the project. • Many other enhancements and bug fixes. Har använt Scrivener i många år. Bästa funktionen är att programmet är som ett Lightroom för texter, spara, organisera och redigera i ett och samma gränssnitt. Oslagbart. There is absolutely no correction if you write in another language than English. Otherwise, great tool. 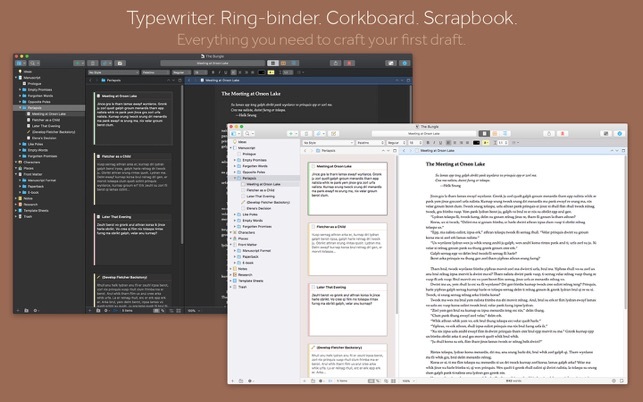 Superb tool for writers, no matter if you're an aspiring writer or already published. It really is invaluable help for me whit my writing.